Samsung mobiles are the leading kinds of mobiles are which are well known for the best kinds of features and specifications. 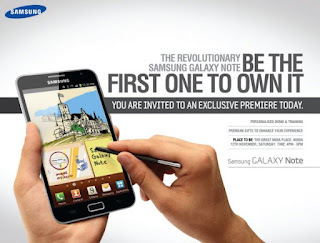 The company has launched a long series of Smartphone’s and the Samsung Galaxy Note belongs to one of it. There are lots of features of it and which can help to get better results. The Samsung Galaxy Note features are really superb. This smartphone is inbuilt with GSM networking technology. 2G and 3G both networks are available in the model. The Samsung Galaxy Note comes with 5.3 inches WXGA HD super AMOLED capacitive touch screen display with 16 M colors. Lots of display features as S Pen Stylus, Gorilla Glass display, TouchWiz UI v4.0, Multi-touch input method and Touch-sensitive controls are integrated in the smartphone. Samsung Galaxy Note is supported with Accelerometer, Digital Compass, Proximity, Barometer and Light Sensors. Resolution of the model is 800 x 1280 pixels. Vibration, polyphonic, MP3 and WAV as ringtones alerts features are supported in the model. This mobile phone comes with Face book, Twitter, Google Search, Maps, Gmail, YouTube, Calendar, Google Talk, and Picasa as social networking services along with some instant messaging services features. The Samsung Galaxy Note comes with stereo FM radio with RDS, audio player and video players as multimedia features for lots of fun and enjoyment. This smartphone is enabled with 3.5 mm audio jack device. Operating system of the model is very fast which can power with v2.3 Gingerbread Android OS. This smartphone is worked with 1.4 GHz dual core processor and Mail- 400 MP GPU which can help to run mobile application very speedy. Some applications as Samsung ChatON, Adobe Flash 10.1 support, Document editor (Word, Excel, PowerPoint and PDF) are also presented in the smartphone. Internet memory of the model is 16 GB and up to 32 GB include with 2GB external memory via Micro SD memory card is also supported. This handset comes with 1 GB RAM as additional memory. The Samsung Galaxy Note is integrated with 8.0 MP main camera which can help to capture clear and nice pictures. Main Camera of the model gives 3264 x 2448 pixels resolution. Autofocus, LED flash, Action Shot, Beauty, Panorama Shot, Smile Shot, Geo-tagging, touch focus, face and smile detection and image stabilization some features are well presented in the model. This smartphone also comes with 2.0 MP secondary camera for live video calling services. The model is enabled with HD 1080p video recording facility with 1920 x 1080 pixels resolution. GPS with A GPS navigation services and Glonass services are also available in the model. Samsung Galaxy Note has NFC connectivity options. Active noise cancellation with dedicated mic, TV-out (via MHL A/V link), Image/video editor some special features are available in the model. This model is also known from Samsung Galaxy Note N7000 and Samsung GT-N7000 models. Standard Battery of the model is excellent which power by 2500 mAh is. Battery of the model is offering talk time up to 13 hours and standby time up to 570 hours. Himanshu is a technology blogger who runs a gadget blog which deals with Apple iPhone, nokia, Samsung android and is currently promoting iit admission blog.